What is Karst? - Welcome to the Paha Sapa Grotto! Karst is a distinctive type of topography and morphology formed from the dissolution of soluble rocks such as limestone, dolomite and gypsum. 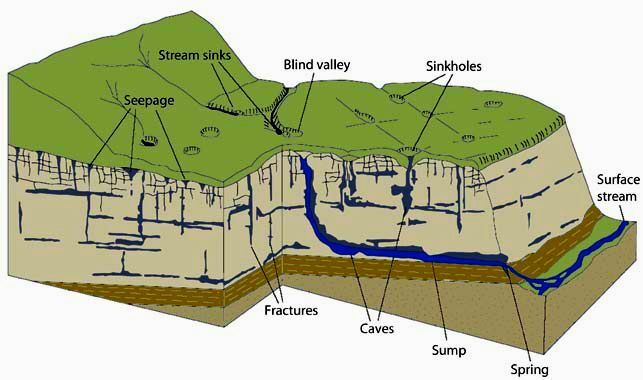 Karst areas are typically characterized by underground drainage systems with sinkholes, dolines and blind valleys on the surface and by caves, solution cavities and solution enlarged fracture systems in the subsurface. Karst features can develop both above and below the water table and they are typically classified based on that distinction. The karst features that develop below the water table are referred to as having a "phreatic" origin and those that take place above the water table are due to"vadose" processes. Phreatic passages are wider than they are tall. They tend to meander and have rounded or flattened ovoid profiles as shown in the adjaent diagram. Phreatic passageways are typically found developed along bedding planes. Vadose passages and developments tend to be linear, and follow fracture systems or to be modifications of earlier phreatic features, In general, vadose developments tend to be taller than they are wide and often have a canyon-like notch at the base of the passage. Since vadose modifications often account for the later-stage decorative formations overprinted on earlier phreatic features, vadose developments are sometimes referred to as "secondary" and the phreatic type as "primary". Karstic and cave systems can develop almost entirely from one or the other of these two end-member processes, but most have origins due to recognizable contributions from both. 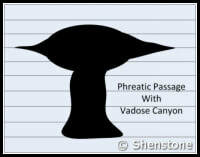 The adjacent diagram shows a phreatic passage that has been modified by a vadose notch or "canyon" at the base.